There are two catagories of energy weapons: Stun weapons and EMD weapons. STUN WEAPONS: Traditional stun technology weapons operate in a 7-14 Watt range and interfere with the communication signals within the nervous system of the target. These stun systems primarily effect the sensory nervous system. Like static on the communication lines between the brain and the body, stun systems interfere with the human command and control systems. However, a small percentage of people with a very high tolerance for electrical stimulation can fight through the effect of these 7-14 Watt systems. EMD WEAPONS: EMD weapons use a more powerful 18 to 26 Watt electrical signal to completely override the central nervous system and directly control the skeletal muscles. This EMD effect causes an uncontrollable contraction of the muscle tissue, allowing the M-Series to physically debilitate a target regardless of pain tolerance or mental focus. 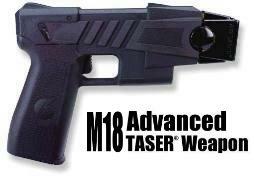 The Advanced TASER® Weapons in the M-Series are EMD weapons -- specifically designed to stop even the most elite, aggressive, focused combatants. Rather than simply interfering with communication between the brain and muscles, the ADVANCED TASER EMD systems directly tell the muscles what to do: contract until the target is in the fetal position on the ground. 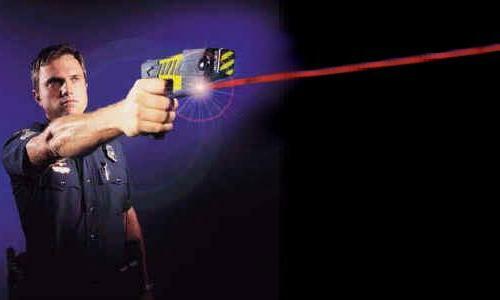 These Advanced TASER® Weapons provide for maximum safety for both yourself and the subject by bringing dangerous situations quickly under control before force escalates to lethal levels. Internet Company is not affiliated with the manufacturer TASER International, Inc.
Stun Gun Weapon is a Trademark of Internet Company, N.A. © 1995-2009 All rights reserved.